Alfredo "Alfred" Molina (born 24 May 1953) is an English actor, known for his roles in Raiders of the Lost Ark (1981), Enchanted April (1992), Maverick (1994), Boogie Nights (1997), Chocolat (2000), Spider-Man 2 (2004), The Da Vinci Code (2006), An Education (2009), Prince of Persia: The Sands of Time (2010), Rango (2011) and Whiskey Tango Foxtrot (2016). Molina was born in Paddington, London. His mother, Giovanna (née Bonelli), was an Italian house-keeper who cleaned rooms in a hotel and worked as a cook. His father, Esteban Molina, was a Spanish immigrant from Madrid who worked as a waiter and chauffeur. Molina grew up in a working class district in Notting Hill that was inhabited by many other immigrant families. Molina decided to become an actor after seeing Spartacus at the age of nine, and attended the Guildhall School of Music and Drama. He also auditioned and was accepted as a member of National Youth Theatre. Molina appeared with Leonard Rossiter in the sitcom The Losers (1978). Molina made his film debut with a minor role in Raiders of the Lost Ark (1981) as Indiana Jones' ill-fated guide, Satipo, during its iconic opening sequence. However, his big break came with Letter to Brezhnev (1985), which he followed with a starring role in Prick Up Your Ears (1987), playing Joe Orton's lover (and eventual murderer) Kenneth Halliwell. He was originally cast as Arnold Rimmer in the TV sitcom Red Dwarf, but he was replaced by Chris Barrie. In the early 1990s, Molina was a ubiquitous presence on British television, with his highest profile role being the lead in the first two series of El C.I.D. Subsequent film roles included Species, Dudley Do-Right, Chocolat, Not Without My Daughter and Enchanted April. With a mid-western American accent, Molina starred alongside Betty White in the US television series Ladies Man, which ran from 1999–2001. He has worked twice with Paul Thomas Anderson, first in Boogie Nights (1997) and then Magnolia (1999). Molina gained wide recognition for his portrayal of Diego Rivera alongside Salma Hayek in the biopic Frida (2002), a role for which he gained BAFTA and SAG award nominations. He played himself alongside Steve Coogan in Coffee and Cigarettes (2003) and gained further commercial recognition when he portrayed the villain Doctor Octopus in Spider-Man 2 (2004), which became one of the highest-grossing films of that year. For the latter, Molina was nominated for a Satellite award as Best Supporting Actor. He reprised his role in the video game adaption. In 2006, Molina portrayed Touchstone in Kenneth Branagh's film version of Shakespeare's As You Like It and appeared in Ron Howard's adaptation of The Da Vinci Code. Molina provided the voice of the villain Ares in the 2009 animated film Wonder Woman. On 1 April 2010, he opened at Broadway's John Golden Theatre in the role of artist Mark Rothko in John Logan's drama Red opposite Eddie Redmayne for a limited engagement through 27 June. He had played the role to much critical success at the Donmar Warehouse in London in December 2009. In addition to acting, Molina is an Acquired Immune Deficiency Syndrome (AIDS) advocate. Not only does he donate towards AIDS research, but also participates in the Los Angeles AIDS Walk and appeared as himself in a documentary produced by Joseph Kibler (who has been HIV+ and paraplegic since his birth, c.1989) about Kibler's life entitled Walk On, first screened in 2013. 2014 Cosmos: A Spacetime Odyssey Alhazen Episode: "Hiding in the Light"
↑ Henderson, Kathy (February 26, 2007). "Broadway Buzz: Q&A: Alfred Molina". Broadway.com. Archived from the original on October 24, 2007. Retrieved August 3, 2010. ↑ Hattenstone, Simon (July 15, 2004). "I give good foreign". The Guardian. London. Retrieved April 23, 2010. ↑ "Alfred Molina scales new heights in 'Fiddler on the Roof'". CNN. Archived from the original on 4 April 2004. Retrieved May 20, 2013. ↑ Díaz, Katharine A. 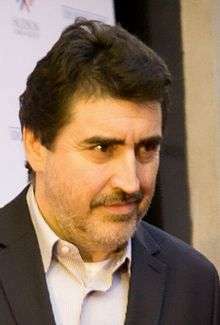 "Accents Make the Man: Actor Alfred Molina makes diversity a trademark". Hispanic (July/August 2004). Archived from the original on 30 October 2006. ↑ "Alfred Molina Biography". Yahoo! Movies. May 24, 1953. Retrieved August 3, 2010. ↑ Lewishohn, Mark (2003). Radio Times Guide to TV Comedy. London: BBC Worldwide. ISBN 0-563-48755-0. ↑ "Comics Continuum cast list". Comicscontinuum.com. June 26, 2008. Retrieved August 3, 2010. ↑ "The Audies 2008 Winners". Audio Publishers Association. 2008. Retrieved August 30, 2016. ↑ Baluch, Lalayn (April 17, 2009). "West to appear in Donmar's Life is a Dream". The Stage. Retrieved August 3, 2010. ↑ "Molina stars opposite Dawn French". BBC News. September 15, 2009. ↑ Stanhope, Kate (July 24, 2010). "Alfred Molina Signs on to Law & Order: Los Angeles". TVGuide.com. ↑ Bobbin, Jay (January 7, 2013). "'Raiders of the Lost Ark's' Alfred Molina: How Indiana Jones 'saved my bacon'". Retrieved January 22, 2015. ↑ Kirkland, Bruce (June 27, 2004). "Alfred Molina set for big-time recognition". JAM! Movies. Retrieved August 3, 2010. ↑ "Marriages England and Wales 1984–2005". Findmypast.com. Archived from the original on 31 August 2009. Retrieved August 3, 2010. ↑ "Alfred Molina — Interview". ABILITY Magazine (December 2010–January 2011). ↑ Mahbubani, Rhea (April 27, 2013). "Walking with pride, support and strength". The Los Angeles Times. Retrieved January 2, 2016. ↑ "Walk On". Santa Fe Film Festival. 2014. Retrieved January 2, 2016. ↑ Eakin, Marah (June 13, 2016). "Exclusive: Hey Arnold! movie gets a name, hefty slate of returning voice actors". AV Club. ↑ Goldberg, Lesley (May 5, 2016). "Ryan Murphy Anthology 'Feud,' Starring Jessica Lange and Susan Sarandon, Set at FX". Hollywood Reporter.